Following Saturday’s goal less draw at home with Penrith, Whitley Bay’s game against Morpeth Town on Tuesday evening produced eight goals. Unfortunately for the majority of the 384 inside Hillheads, it was the visitors who came out on top, with the damage done in a devastating first half display. With the mist rolling in off the sea and reducing visibility, league leaders Morpeth totally dominated the opening 45 minutes. The Highwaymen capitalised on some poor defending and scored five times in a 20-minute period. Luke Carr opened the scoring on 25 minutes after being set up by Jordan Fry. Five minutes later Carr doubled the lead. Then a Michael Chilton double and Fry strike made the score 5-0 at the interval. 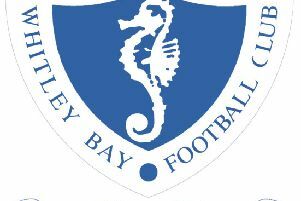 The second half saw a complete reversal of fortunes with Bay making two substitutions and changing their formation. They posed much more of a threat and soon pulled a goal back through Liam Hudson. Adam Shanks headed home a second with ten minutes to go and from then on it was all the home side. Stuart Bramley got the third with another header and just before the final whistle a fierce shot from Hudson flew inches past the post.